I know a lot of you are anxiously waiting for the results of my recently concluded Nikon giveaway. Please bear with me as I try my best to sort through all of the entries. Most probably, I will announce the winner on my blog next week. In the meantime, why don’t we have another giveaway? This time it’s from our lovely friends over at Skullcandy. You might’ve seen one of my many Skullcandy earphones on my outfit post here. If you join this giveaway, you can get one for yourself too! Follow Skullcandy Philippines on Twitter. Deadline for entries is on November 7 at 11:59PM. As usual, no multiple entries please. This contest is open to Philippine residents only. The winners will be chosen via Random.org and announced via my Twitter. Good luck everyone! 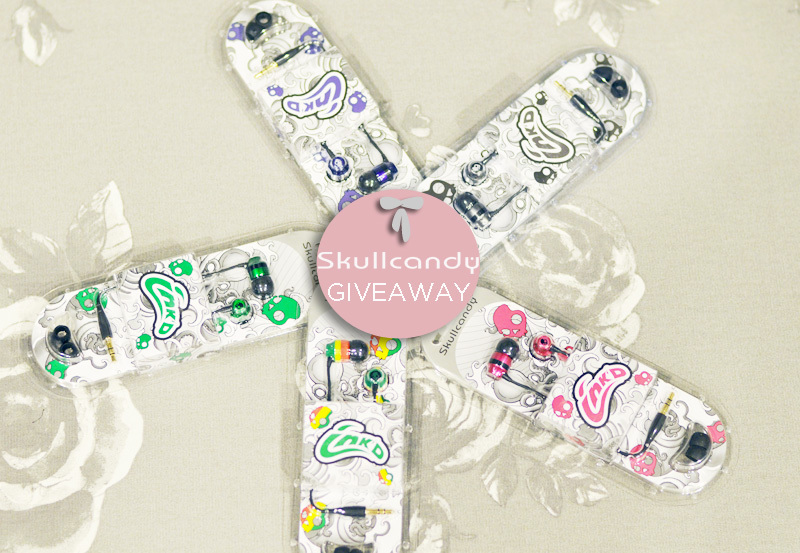 miss camille, where can i buy po itong cute skullcandy earphones po? Hello Ms. Camille been waiting your reply. Yes, please be patient. Sorry! Hi! It’s the sponsors sending them out. I believe they just did. thanks Skullcandy and Miss Camille! Hannah Mariel Reyes – Name.